There are thousands of songs and works on Raghavendra Swamy or Rayaru as he is affectionately called. Raghavendra Swamy (1595-1671) was the pole star of the second revival of the Haridasa Sahitya and the seer who led the Madhwa matha through turbulent times in the 17th century. Many saints and Haridasas like Vijaya Dasa, Gopala Dasa, Pranesha Dasa, Jagannatha Dasa of Manvi, Guru Jagannatha Dasa have written on Rayaru, his miracles and his works. Several mathadipathis of Mantralaya Matha and even pther maths have written on and about Rayaru. One such composition on Rayaru is by Suvidendra Theertha. This is small but beautiful composition on Rayaru. This is a Ashtaka stotra dedicated to Rayaru. He had the great fortune of learning under Raghavendra Swamy (1595-1671). He also had the fortune of succeeding Raghavendra Swamy t the Sri Matha which subsequently came to be known as Raghavendra Swamy Matha or Mantralaya Matha. He was also among the privileged people who saw Raghavendra or Rayaru as he is affectionately called entering Brindavana in Manchale or Mantralaya in August 1671. It was this man who reverentially held the hand of Raghavendra Swamy and led him to the Brindavana. It was also this man who supervised all the rituals and rites connected with the worship of the Brindavana of Raghavendra Swamy. He was also a close relative of Raghavendra Swamy and he saw Rayaru at close distance for several decades. He also has the distinction of personally supervising the first aradhane celebrations of Raghavendra Swamy. The Aradhane of this saint was held recently at Srirangam in Tamil Nadu where his Brindavana is located. This holy person is none other Yogendra or Yogeendra Theertha. Yogendra Theertha was the son of Raghavendra Swamy;s poorvashrama brother, Gururaja. A favourite of Raghavendra Swamy he learnt under him and spent years under his guidance. When the tome came for Rayaru to enter Brindavana, he choose Yogendra Theertha as his successor and gave him his last upadesha and patha (teaching religious texts). Yogendra Theertha was on the peetha of Sri Matha from 1671 to 1688. He was followed by Soorendra Theertha his brother. Before taking sanyasa, he was known as Venkannacharya. It was Raghavendra Swamy who bestowed on him the nomenclature of Yogeendra Theertha. His other brothers, Vasudevacharya and Mudduvenkatakrishnacharya, also succeded hi to the Sri Matha. Yogeendra was considered to be a brilliant scholar and intellect. It was during his time that Venkanna pant or Dewan Venkanna re-conveyed the village Manchale or Mantralaya to him. After Rayaru entered Brindavana, Yogeendra stayed back for some time before embarking on sanchara. He defeated Kala Shastri and others at Bhagyanagar in debates and upheld Dwaitha siddantha. He then retraced the steps of Rayaru and visited Kumbakonam. Here, he had the darshana of Vijendra Theertha before coming to Srirangam which was then being administered by the Nayakas of Madurai. Muddalagadri Nayaka of Madurai, gifted Arambhanna village on the banks of Tamraparni and also the Kalla Mutt located the west of Chitra street in Srirangam on Akshaya Thritheeya in Siddharthi Samvatsara (1679) to Yogendra Theertha. .
Rayaru then came in a dream to Yogendra Theertha and asked him to settle down at Srirangam itself. He also entered Brindavana on the tenth day of Magha Shuddha in Vibhava Samvatsara. Subsequently, his two brothers, Vasudevacharya and Muddhukrishnacharya, also became pontiffs of the Sri Matha after him and entered Brindavana at Srirangam itself. Even today, we can see the Brindavana of the three brothers at the Raghavendra Swamy Matha in Srirangam. This is a short but beautiful composition by Raghavendra Swamy (1595-1671)on Hanuman. Raghavendra Swamy, in his earlier avatar as Vyasa Raja (1447-1539), consecrated 732 idols of Hanuman throughout the length and breath of the VijayanagarKingdom of which he was the Raja. Born in 1447 near Bannur, Mysore, Vyasa Raja has his earlier education under Bramanye Theertha of Abbur and subsequently under Sripadaraja of Mulabagal. It was Sripadaraja who asked Vyasaraja to take over as the Rajaguru of Vijayanagar. Vyasaraja became the Rajaguru for six Vijayanagar Emperors, including Krishna Deva Raya (1510-1539) and his successor, Achuta Deva Raya (1529-1542). Vyasa Raja consecrated the first Hanuman at Chakratheertha in Hampi and the second at Mulabagal Matha of Sripadaraja Theertha. He consecrated more than 360 Hanuman idols in and around Penugonda, several of which can still be seen. 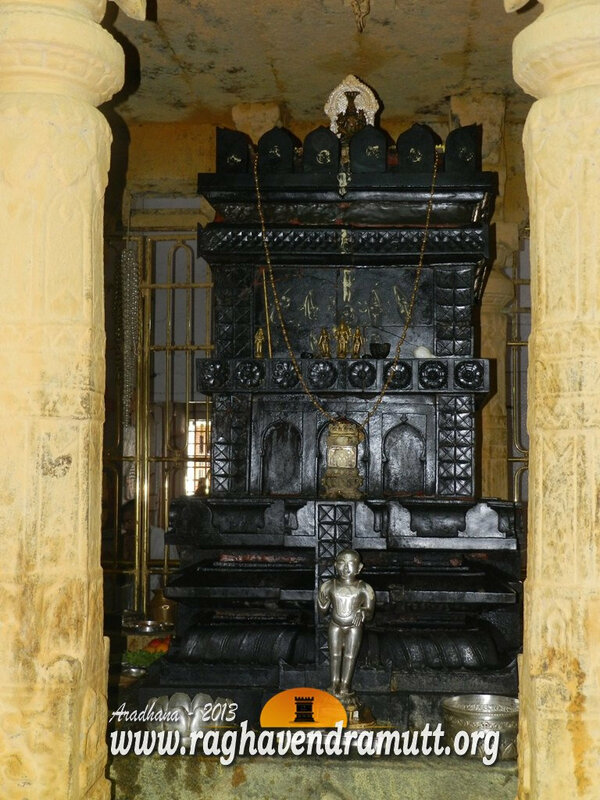 As Raghavendra Swamy, he consecrated three idols of Hanuman. The beautiful idol of Hanuman n front of the Brindavana of Raghavendra Swamy in Mantralaya was consecrated by his immediate successor, Yogendra Theertha. Raghavendra Swamy saw the five headed Hanuman at Gandhal and hence, the name, Panchamukhi Hanuman. He meditated in a cave there which still can be seen. This is a rare composition by Raghavendra Swamy on Hanuman. The Kannada lyrics for this suladi on Hanuman is as follows. Swamy. He wrote under the pen name or ankita Venugopala. Incidentally, he also consecrated a temple dedicated to Venugopala in Manchale village, now called Mantralaya, which can still be seen. Interestingly, Vyasa Raja too has composed a stotra on Hanuman. This was when he consecrated the Yantrodharaka Hanuman at Chakratheertha in Hampi. Unlike the stotra by Raghavendra Swamy which is in Kannada, the Yantrodharaka stotra by Vyasa Raja is in Sanskrit and the stotra is believed to be very powerful. As we can see here, this is one of the few compositions where Vyasa Raja has not used his pen name of ankita of Krishna or Sri Krishna. He ends the composition with his own name as Vyasaraja Theertha.